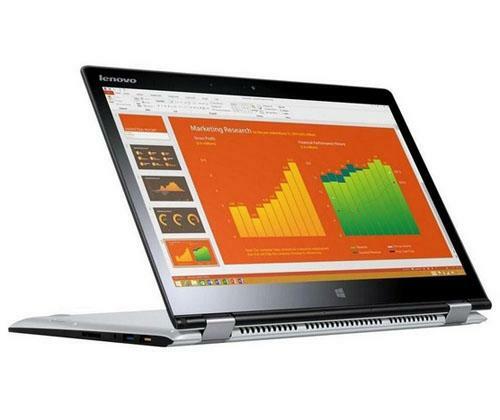 Lenovo cater to a range of different laptop users, whether you need a laptop for gaming or multimedia work or a tablet ideal for on the go. With such a wide range of choice, we’re not surprised if you’re a little stuck. 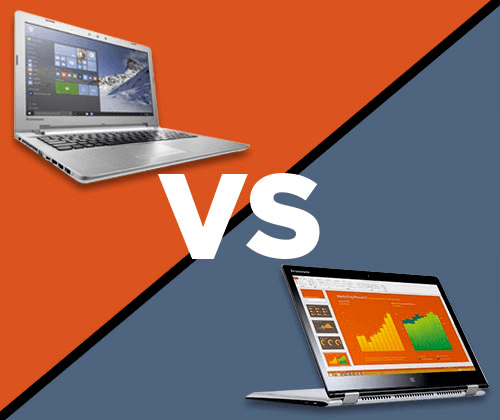 The IdeaPad 500 and Yoga 3 are both great devices and are both available at the same price so it could be difficult to choose between the two; continue to read our specifications and comparison for a better idea of which one is suited to you. The Lenovo IdeaPad has AMD MESO XT 2GB dedicated graphics to deliver expressive detail and is a very impressive device overall. The 1920 x 1080 resolution is a common pixel density, found in many laptops of a similar range. However, the colours seem to lack vibrancy and look somewhat muted and dull. The common laptop would have roughly 249 nits of brightness, but the Lenovo IdeaPad only has 216 nits; falling below average. According to numerous tests, this laptop only covers 61% of the sRGB colour spectrum, again below average. Alongside this, graphic quality is good when sat directly in front of the screen but at different angles; the picture quality can appear slightly shady and difficult to see. Despite these faults, this device is sufficient for home use, perhaps snuggled up in a blanket on the sofa for some Netflix. The Yoga has slightly better performance in the graphics department. The Integrated Intel HD 5500 Graphics prove to be more than adequate, allowing you to become in immersed in your favourite film. Viewing angles are significantly better than the IdeaPad. However, brightness is lost when viewing from acute angles. The overall brightness is drastically better than the IdeaPad, measuring to be 317 nits so it’s great for watching movies in the evenings or Skyping with friends and family. The white casing with silver accents is eye-catching and a nice break from the standard black or silver. The casing is also very durable, you can lean on the keyboard without even the slightest bend or creak. However, despite the colour, fingerprints are still just as visible as they would be on a black laptop. We appreciate the durable build but this laptop is a little bulky and on the heavier side, so it’s not the best choice if you need for travelling. Starting from 1.6kg, this hybrid is a great companion and won’t weigh your bag down. However, at a size of 334.9 mm x 229.5 mm x 18.3 mm, it isn’t the most ideal size to travel with. Despite this, the versatility of the device with a choice of different modes is a redeeming quality to this laptop. You’ll always have the choice of Laptop, Stand, Tent, or Tablet mode to ensure comfortable use wherever you are. The robust and sturdy exterior means bumpy rides won’t damage this device, so you can slip this in your bag and go out, without worry. The kickstand is hands down the best design feature on this device, setting it apart from most other hybrids and tablets. The Windows 10 Home operating system is a great choice, whether you’re a student or a business professional, as you’re always guaranteed easy use. There are plenty of management features such as the live tiles on your homepage which you have the option to customise. Always on Facebook? You can personalise your homepage so you have quick access to any of your favourite and most used sites, apps and programmes. This hybrid utilises Windows 8.1 which is fairly similar to windows 10. You have almost all the same features such as the tiled homepage for quick access to apps, sites and programmes of your choice. If you prefer the older version of the software, this device would be great for you, or you have the choice to purchase the Windows 10 operating system. Both of these devices have all the desired ports you’d look for in a laptop, such as an earphone jack, USB ports etc. They both also ensure quick connectivity to the internet. However, for gamers or those who work with graphics and need advanced connectivity options, we recommend the IdeaPad, as it also includes a 4-in-1 card reader (SD, SDHC, SDXC, and MMC), HDMI port, RJ-45 port and VGA port. 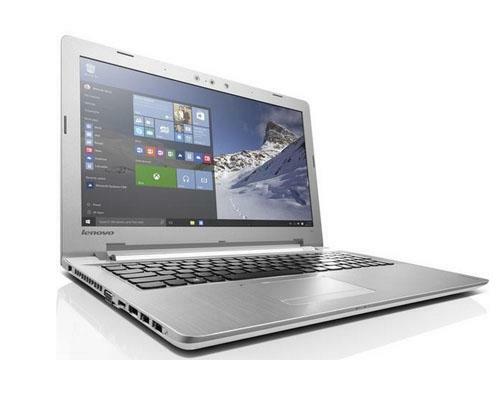 The IdeaPad is a clear winner in the storage department with 1TB of storage space. You’ll have plenty of room for apps, programmes, software and work with this device; as well as heaps of space for music, pictures, T.V series and films. You’re still provided with a more than adequate amount of storage space, but if you’re a hoarder you may face a little difficulty saving all those holiday albums or music files. However, the USB port ensures quick transfers and easy saving onto USBs and other external storage devices. If you’re looking for a laptop to get work done, this is the best choice. The Intel Core i7 (6th Gen) processor is the most powerful out of the Intel family, so you can multitask away, run apps simultaneously and also run power-consuming software with ease, and without worrying about draining battery life. The Intel Core i7 (5th Gen) processor is also very good at handling tasks such as those stated above. It’s more than capable in comparison to other standard tablets and hybrids that perhaps utilise an i3 or i5 processor, so for maximum productivity, the IdeaPad is your best option. The JBL speakers can fill up a large room with ease! However, if you’re cranking up the volume there’s a little bit of fuzziness if you stay on the laptop’s default mode. We recommend changing the settings on the Waves Audio app, and switching to a suitable mode for a clearer sound and heavier bass. The front-facing stereo speakers provide a great deal of sound and can easily fill up a medium sized room. So put on your favourite album whilst you get ready for the day, and there’s no need for additional speakers with this hybrid. Now that you’re armed with all the information you need to know, you can choose which Lenovo device is best suited to you! Still undecided or looking for something different? 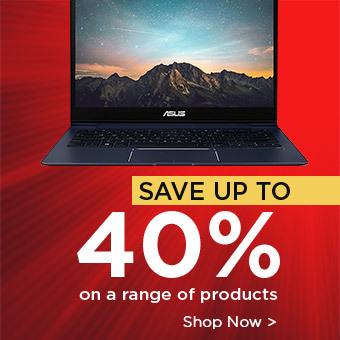 Check out our website for a wide range of laptops or convertible laptops, and you’ll be sure to find a device that caters to your needs. For more helpful reviews, top picks and technology related news, visit our blog.